El trabajo expone algunas estrategias psicológicas útiles para potenciar el talento de los futbolistas que se forman en el alto rendimiento, y se estructura desde la base del conocimiento empírico desarrollado en el trabajo de campo. La planificación psicológica incluye el proceso de evaluación por medio de cuestionarios estandarizados y de elaboración propia, entrevistas semi-estructuradas y hojas de registro observacional (Morilla y cols. 2009). Las variables en las cuales se interviene incluyen la autoestima, la motivación, el control emocional, la atención y concentración, la capacidad de adaptación, la competitividad, las habilidades de comunicación, el liderazgo, el trabajo en equipo, la búsqueda de excelencia, los entrenadores, la familia, y la formación personal y académica. Dentro de las estrategias de intervención sobresalen las siguientes: planificar los objetivos psicológicos en función de los que tengan la entidad y el entrenador, seguir un enfoque pragmático, integrar la preparación psicológica a los entrenamientos y partidos, trabajar en equipo con otros psicólogos y de manera interdisciplinaria con los demás técnicos, fomentar el desarrollo integral del futbolista, innovar las propuestas metodológicas utilizadas, ofrecer un servicio psicológico de élite y fortalecerlo con el respaldo institucional.Palabras clave: Talento deportivo, planificación psicológica, estrategias psicológicas. 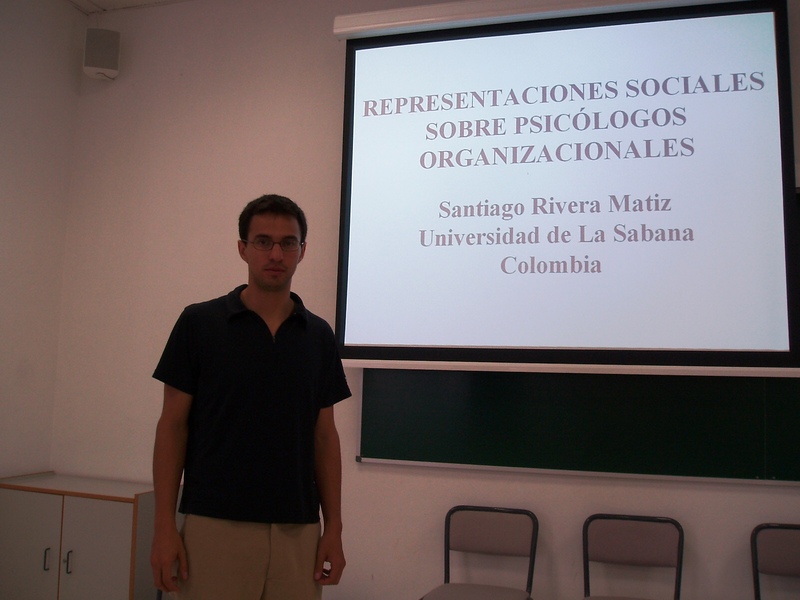 III Congreso de la Sociedad Iberoamericana de Psicología del Deporte, Bogotá, Colombia 2010. 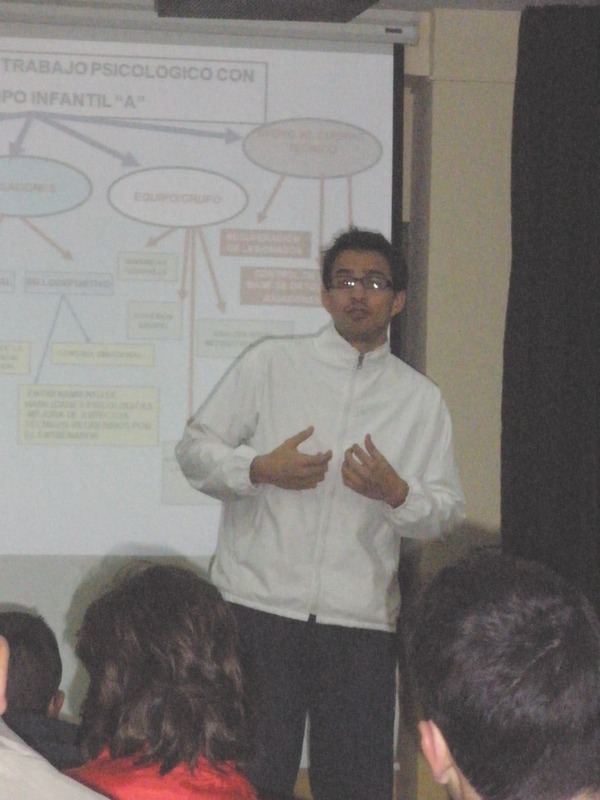 Clase de Psicología del Deporte, Licenciatura de Ciencias de la Actividad Física y del Deporte, Universidad de Vigo, Pontevedra, España 2010. II Jornadas sobre Cultura, Amistad y Salud a través del Deporte, Sevilla, España 2010. Taller práctico llevado a cabo con Miguel Morilla en el XII Congreso Andaluz de Psicología del Deporte, Jaén , España 2009. 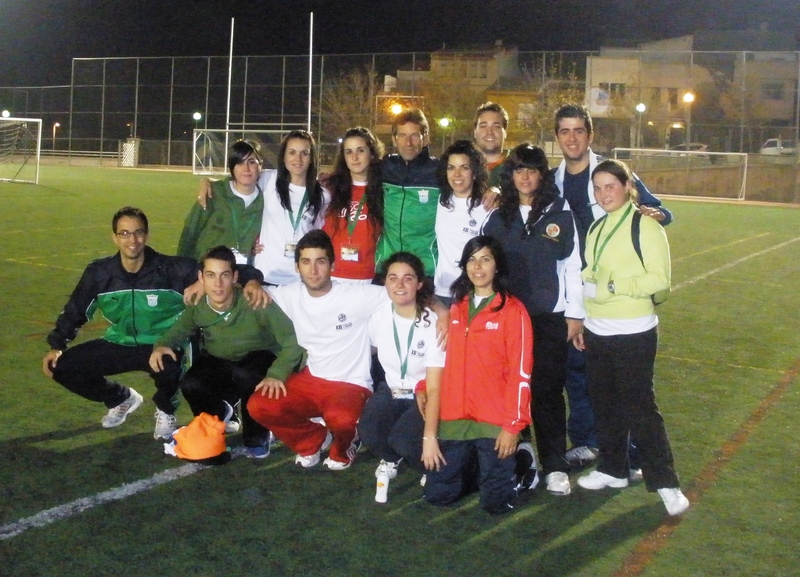 Coordinador del simposio “Psychological Work from Grass-roots to Elite in Sevilla Fútbol Club”. XII Congreso Mundial de Psicología del Deporte. 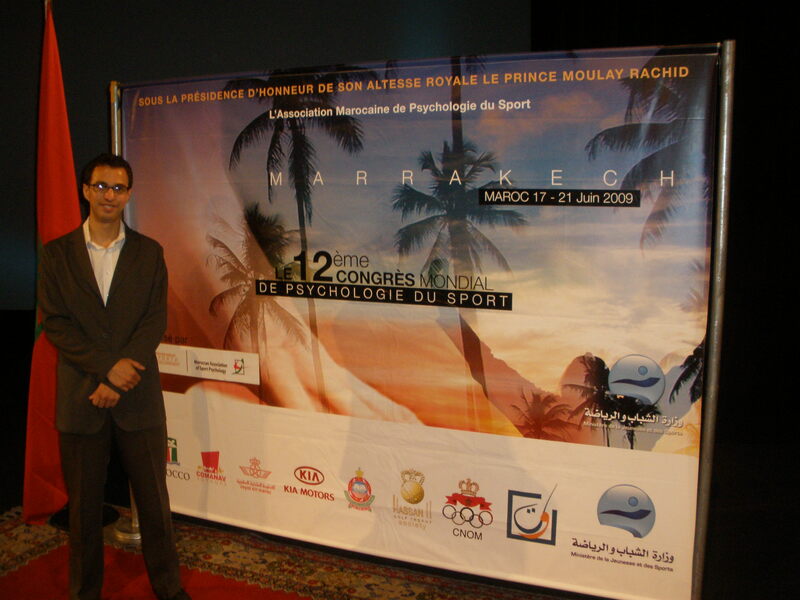 Marrakech, Marruecos 2009. The participation of young athletes in the sports develop, since it is well known, the skills, the physical form, the “character”, the social skills and the recreational experiences. To generate situations in which the sportsmen have the option to mature and to grow as a person is necessary and obligatory. The idea has been that during the formation stages of the football player it turns out to be fundamental the development of all the qualities necessary for the future high competition. These requires an integral training, included the psychological one, close to the follow-up of those aspects that accompany and affect in a correct development of the sportsman and demand the application of a meticulous Psychological Work Plan. The promotion of health and the quality of life of the young football player are taken into account, and the evaluation, analysis and intervention of the events that are relevant in the practice of football, as well as the principal persons involved in its formation. All this contributes with real advances to the Sevilla F.C, assuring a human growth parallel to the sports one, without forgetting the joint work with other technical personnel in the maximum player’s level contribution to the main team. It is evident that sport psychology is gaining positions inside the general preparation in sports, and in this case, in the football player. A proof of it is the work that has been made both in an applied and theoretical areas during the last 10 years, supporting football players from initiation and up to their consolidation as professionals. The work in grass roots football elite club’s main objective is to form players pointing to become professionals. Therefore, the development of those qualities needed to the future high competition, including the psychological, are fundamental. That might suppose a meticulous planning and it’s continuity in time, taking into account the promotion of health and the young footballer’s quality life, the analysis and study of relevant sport events that, obviously, will contribute in real advances towards young’s performance in the sports and human aspects (Morilla and Pérez, 2002). Initiation elite football is understood as a differentiated area with its own characteristics and specific demands. Therefore, development of psychological abilities and capacities needed for competition are developed, looking for a future strengthening and perfection in a professional level. Intervention incorporates all those people that configure its environment: companions, coaches, parents, trainers and managers. Besides high performance in sport, the planning includes personal and academic formations which are also taken into account (Morilla and Gómez, 2009). As a complement to the work made with the footballer’s, an Improving Emotional Intelligence Program has been developed and applied to facilitate player’s whole development and learning process. Psychological work in Sevilla F.C grass root aims to generate situations in which the players could become more mature and grow as whole footballers and persons. Perseverance, systematic work, order, and more of all generous effort will become in real huge desires. A Sports – Formative Program must include the different facets that construct the life of the young athletes. Their personal capacities are the base with which they confront the complex motive, environmental or psychological demands of a sport like football. The above mentioned capacities are of diverse nature: physical – motive, technical, intellectual or emotional. The progress of any of them in the sports context, and better still, the development of all parallel, in an integral way, should be translated in the global improvement of the young football player. The Program tries to demonstrate that an integrated, systematic and rigorous long-term work can make players reach a good level in sports and academic performance, besides obtaining a good human formation. It is necessary that the sports practice facilitates the adjustment to the different contexts in which the young football player is developed and, therefore, to transfer what is learned fundamental. A psychological and methodological progression will follow the work from the initiation in technical, tactical, strategic and psychological aspects that are necessary and appropriate for football high performance requirements. An opportunity of integrated personal and sports development is offered, forging the capacities and aptitudes of the football player for posterior and more specific works according to the needs and demands of the elite sports competition. The purpose was to describe and analyze the psychological needs of grass-roots football elite players with reference to the arousal, motivation, concentration and self-confidence levels. The hypotheses were: a) selected players develop better psychological capacities than substitutes, b) a better psychological skills are acquired with more years of practical experience, and c) a better domain of psychological processes is developed at old categories. The participants were 176 grass-roots football players from the Sevilla FC., between 12 and 18 years old. The measure was taken with the Sports Psychological Needs Questionnaire (Dosil et al., 2005), that consists of 30 items and measures self-confidence, arousal, concentration and motivation. The answers to the items correspond to a Likert kind scale. The instrument was validated by the factorial analysis and was applied at the end of the season. The SPSS 13.1 software employed to analyze the results. It was found that: a) selected players have better attention and motivational capacities than substitutes (significance level <0.05); b) more experienced players do not necessarily have better acquired psychological abilities; and c) differences between attention and motivation were found, according to the category, but there is not always a better domain of psychological processes. In reference to the attention and concentration, 12-14 years old group obtain better results that 14-16 years old group (Media=5.29 and 4.13), and concerning motivation (16-18 years old group) and (14-16 group) with Medias= 5.86 and 4.94, significant differences where found. Conclusions: Experience is not a predictor of better psychological abilities, but the category does in terms of motivation. Activation and self-confidence have no relation with the fact of being selected, the experience or the category. 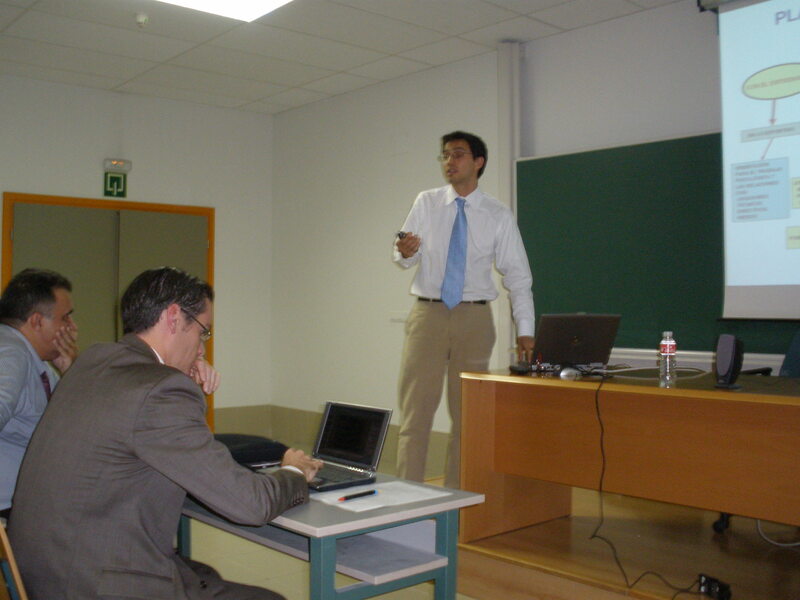 Seminario práctico para el Comité Técnico Andaluz de Entrenadores de Fútbol, Sevilla, España 2009. II Congreso de la Sociedad Iberoamericana de Psicología del Deporte, Torrelavega, España 2008. Taller Práctico en el XI Congreso de Psicología de la Actividad Física y el Deporte, Sevilla, España 2008. X Congreso Nacional de Psicología Social, Cádiz, España 2007.